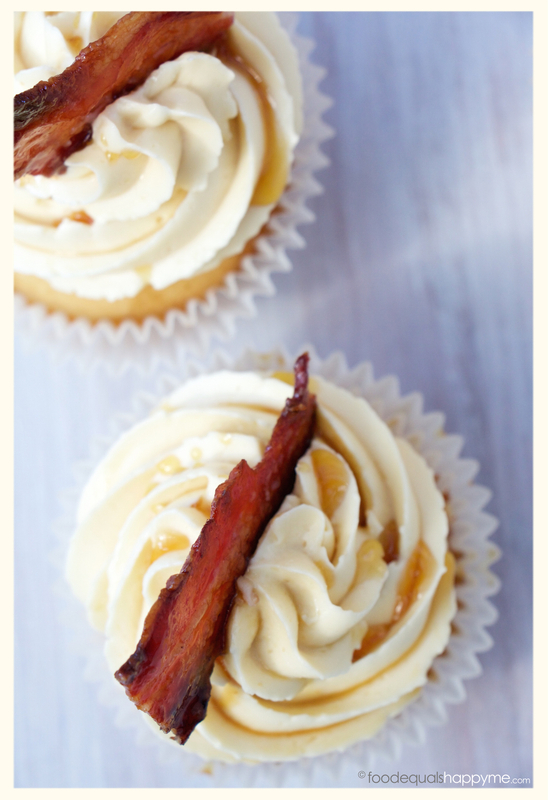 If you didn’t know already, salty sweet is hands down my favourite flavour combo, and these Maple Bacon Cupcakes definitely do not disappoint. Preheat oven to 180 degrees celcius. 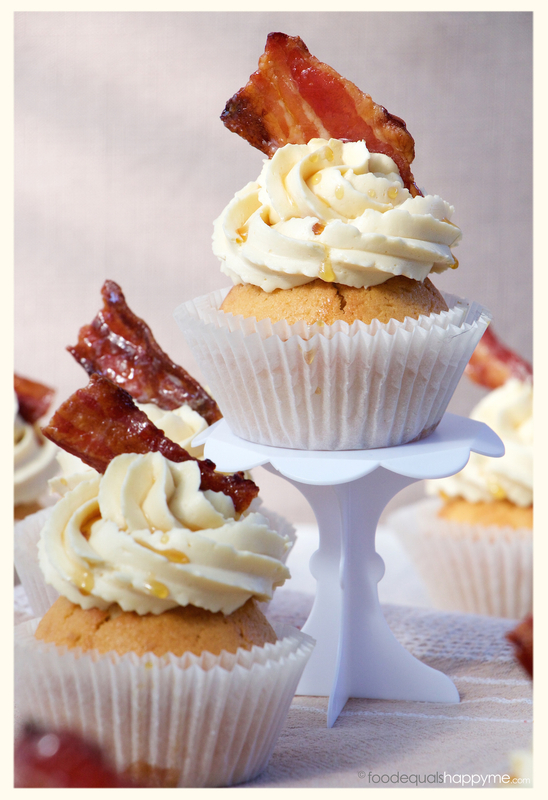 Place the butter and sugar in the bowl of an electric mixer and beat until light & fluffy. Add all the remaining ingredients and beat for a further 2-3 minutes or until the mixture is smooth and creamy. Spoon the mixture into patty cases, filling each around 2/3rds full (you should get about 18). Bake in a preheated oven for 18-20 minutes or until cooked when tested with a skewer. Leave in tins for a few minutes before transferring to a wire rack to cool completely. Increase the oven to 200 degrees celcius. 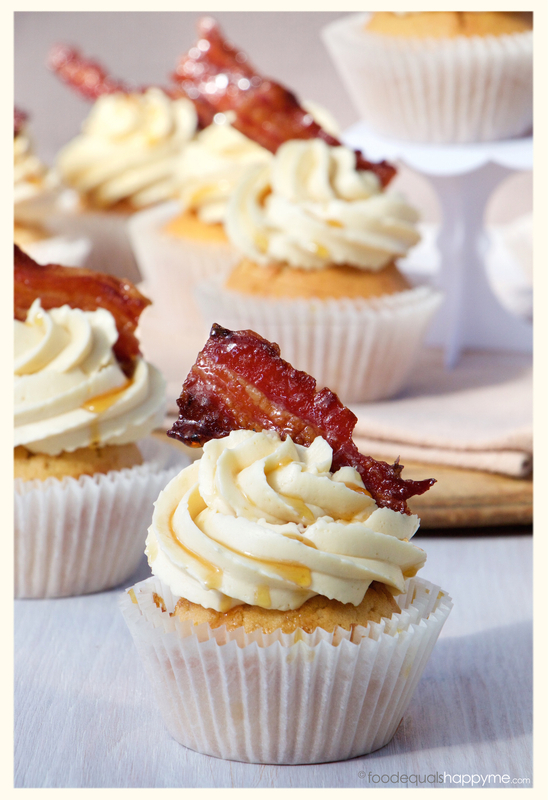 Place the bacon on a wire rack over a baking tray and brush liberally with maple syrup on both sides. 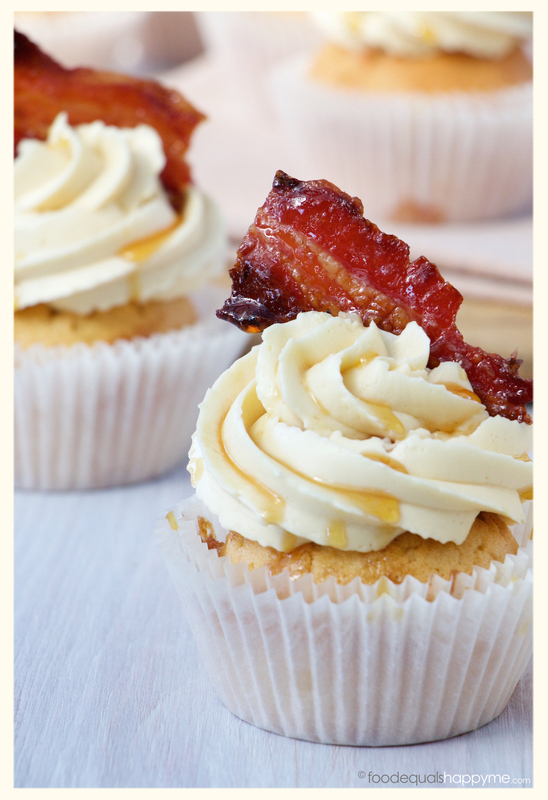 Cook the bacon in the oven until it is caramelised and crispy, then set aside to cool. To make the frosting, place the egg whites and sugar in the bowl of an electric mixer. Place the bowl over a pot of simmering water and gently whisk until the mixture reaches 140 degrees fahrenheit when tested with a candy thermometer. Take the bowl off the heat and pop it on the mixer. Using the whisk attachment, whisk until the egg whites are thick & glossy, and the bowl is neutral to the touch (it should take about 10 minutes). Next, change over to the paddle attachment and add tablespoons of the softened butter to the mixture until it is fully incorporated. Once you’ve added all the butter the mixture will probably look like its curdled, don’t worry it’s not, just keep mixing it and in around 5 minutes or so it will become smooth and creamy. Definitely don’t throw it out, just keep mixing and it will come back to a perfect frosting consistency. Once it’s reached the right consistency, and while the mixer is running, add the maple syrup in a steady stream until combined. Sprinkle in some sea salt flakes to taste and mix through. 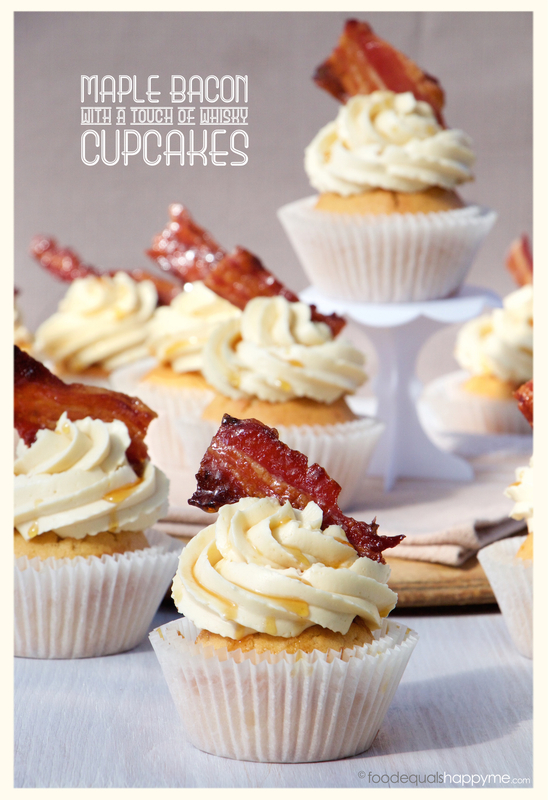 Place the frosting in a piping bag fitted with a star tip, and pipe generous swirls onto each of the cupcakes. 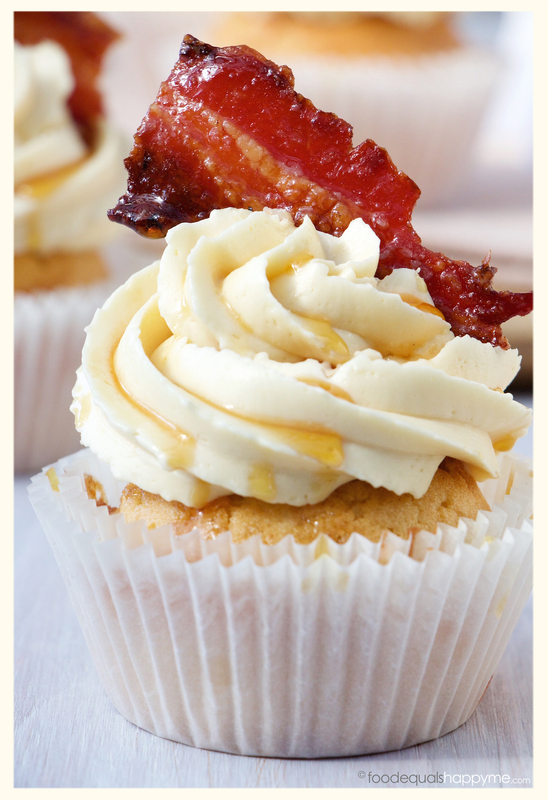 Top each cupcake with a shard of the candied bacon, and drizzle with a little extra maple syrup to serve. This will be perfect for Father’s Day in my house! Yum! Salty sweet is also my favorite combination! I will be thinking about these all day, thanks a lot! Lovely pictures as always! Whoa! 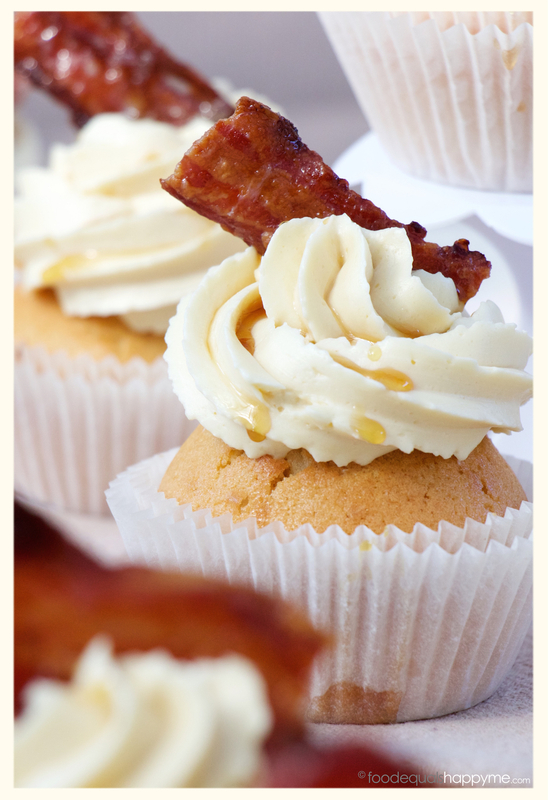 That bit of bacon on top is the cherry on a very special cupcake!! YUM!! !